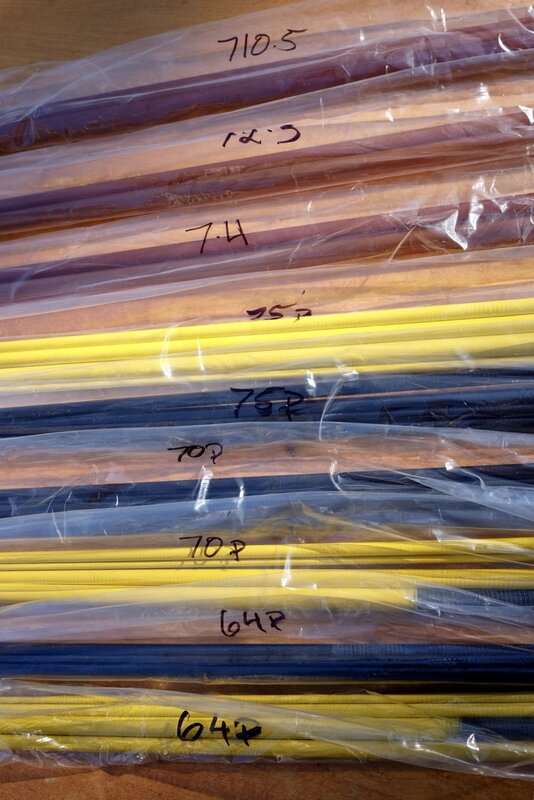 Retiring and Rod Building and Blanks — C. Barclay Fly Rod Co. Being relatively new to the Winston Salem area I still meet a lot of new people. It's always interesting to hear the reactions from people I meet when they ask what I do for a living. One guy recently said, quite intuitively I might add, 'so you have a hobby for a job - what are you going to do when you retire?' I've joked, somewhat seriously, that I won't retire as there's no need. Maybe I'll just slow down a little, but then I'm not all that fast so that doesn't make much sense either. It seems like by now I'm fairly unemployable so I hope to build fly rods until I can't. Anyway, I've got a new rod series coming that I'm very excited about. How excited am I? I'm so excited that I'm going to retire my two previous series of rods and sell some surplus blanks. That's something I said I'd never do. Don't get me wrong, I love the 'brown ale' and 'p' series. I've learned a lot in creating them, still fish these rods often and love them dearly. I just feel it's time to offer something new. This lines up with my idea of building 'small batch' fly rods and hopefully helping to retain a freshness in the market and value for those who've bought rods from me in the past. I'll make the new series details available over the next month, by the way. I will keep building out the orders I've received for the previous series and will keep a few blanks on hand for those 'just in case' situations but I plan to sell several blanks over the next few weeks to allow others to build on these blanks. Who knows, maybe I'll bring them out of 'the vault' at some future time. I'm also happy to 'reserve' a blank for someone for a future build as well. There will only be a few of each model available so grab them while you can. In order to give my international friends a chance at these I will not list these on my 'for sale' page on my website (it's not set up for calculating international shipping at the moment). So in order to streamline the process, please contact me using the form on my 'contact me' page here: http://cbarclayflyrods.com/contact/ I'm fully aware that most adults have short attention spans and are capable of very little at this time of year and reading down this far has passed their limit on reading comprehension so I expect several people to contact me via other methods and I will try to manage those communications as well. But please try to play by the rules, if at all possible. On each blank I'll mark the alignment and guide spacing as well as fit the ferrules. Prices include US shipping, international buyers will be quoted a reasonable shipping cost. Blanks will be ready to ship first week of December. I am happy to discount shipping for multiple blank purchases. Payment accepted via credit card by phone, Square, Paypal, Venmo, Cash App, and check or money order. Please note that I'll be spending Thanksgiving day with my family and I plan to be fishing Friday so I will answer emails, pm's, dm's, voicemail, smoke signals, carrier pigeon, and text messages as I am able. I continue to be so thankful for everyone's support in this little corner of the fly fishing world. As always, please holler if you're in the area and want to fish or stop by. 24 November update: thanks for the overwhelming response! All blanks are sold. However, if you’ve contacted me and have not heard back I somehow missed it - so please contact me again. I will work hard over the next week to get all orders out.